Our list of new books is now updated. Last month, the Law Library received books on the WTO, climate change, privacy, and legal history, among other topics. 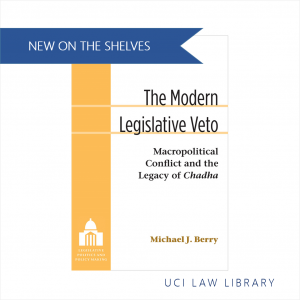 Using an original dataset of legislative veto enactments, Berry finds that Congress has actually increased its use this oversight mechanism since Chadha, especially over defense and foreign policy issues. Check it out upstairs in the Reading Room at KF 4944 .B47 2016. Next PostNext Second monitors – new in 4 study rooms!